ProEdge Storm® Hip & Ridge Shingles are designed to work with TruDefinition® Duration STORM® Shingles with patented WeatherGuard® Technology. Hip & Ridge Shingles help provide a finishing touch to complete the look of the roof. 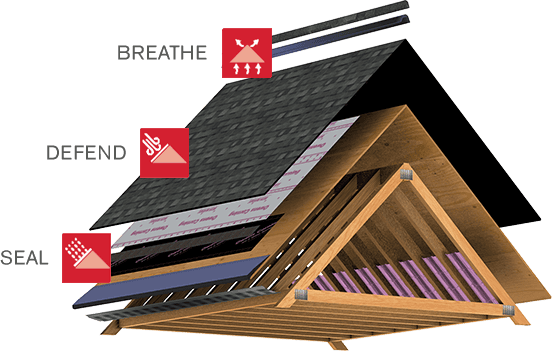 ProEdge STORM® Hip & Ridge Shingles are required to complete a UL 2218, Class 4, Impact-Resistant Roofing System. ProEdge STORM® Hip & Ridge Shingles are part of the Owens Corning® Total Protection Roofing System®^. Piece size 12" x 12"
Lineal Feet per Carton 33ft. To maintain the 130-MPH Wind Resistance Limited Warranty, each ProEdge STORM Hip & Ridge Shingle must be hand-sealed. Failure to hand-seal ProEdge STORM Hip & Ridge Shingles will reduce wind warranty to 110 MPH. Refer to the installation instruction for complete details.